Hello ... Hello ... my old friends ... It's great to see you once again! I must admit that when Yours Truly KJS saw the above covers the other week whilst searching for "Something Else" [if you'll pardon the pun!] over at amazon.co.uk, I thought that it was another of those many Roy Wood CD compilations. But in my ignorance, I neglected to spot that it was the recent paperback issue [on Monday 8th December] of John Van der Kiste's excellent 2012 e-book update of his "Roy Wood: The Move, Wizzard and Beyond" book, which was originally published back in 1986. 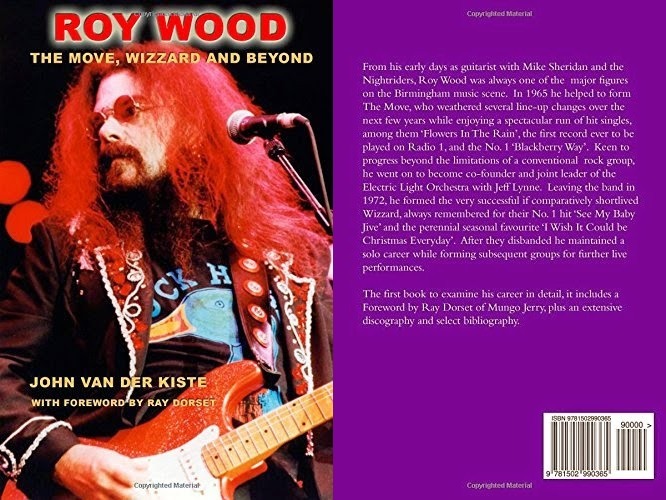 ELO Beatles Forever recommends Roy Wood: The Move, Wizzard and Beyond" by John Van der Kiste to those enlightened folks who like Roy Wood, ELO, Jeff Lynne, The Move, 'Brum Beat', The Beatles and related artistes. Interesting. Will buy after I get some rare Roy CDs first.